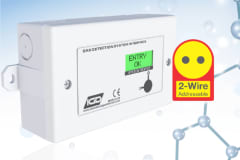 Our addressable Room Status Indicator is the next step in gas detection evolution. The status indicator allows you to show live readings of up to 8 detectors/devices in the specified rooms. The system provides both a visual indication of the rooms current status, but also have built in sounders, to provide both a clear visual and audible alarm status. The door status indicator allows you to instantly know the current hazard in the room without confusing it with a fire alarm. The system provides clear unambiguous alarm indication. The room indicator utilises the same technology as our ground breaking 2-Wire addressable systems, (watch our 2-Wire Intro Video on Youtube)using two core cables for both power and communication. The status indicators have up to 7 input and output options. This allows you to add additional detectors off the status indicator. The room status indicator also be programmed to interface to standard 4-20mA detectors. This means, temperatures, pressures, flows, in fact any sensor that has a 4-20mA output can be read onto a detector node and then displayed on a room status indicator.